Deep Bore Weld Cladding : TIG hot wire cladding , or Bi-Metal -Weld cladding) will be the most appropriate procedure for a wide range of applications. Deposits buffer layers (buttering) allowing different base materials to be welded together. Bi-Metal Pipe combining the features of metallurgical and mechanical clad pipes. The fine grain structure of the deposited material, the evenly formed surface of the layers, the possibility to weld in all positions and the extraordinary flexibility of the process management are reasons to prefer TIG hot wire welding for delicate cladding applications. We are able to maintain stringent deposition and dilution rates based on customers’ requirement. Our list of clients includes international manufacturers in the Oil, Gas and Petrochemical and Marine Engineering industries. 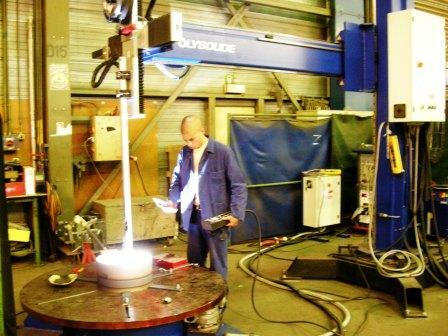 TIG welding allows precise control of the heat input so workpieces with complex geometries or irregular shapes can be treated (there is also the possibility to deposit layers of different thickness, to vary welding parameters during ignition or downslope within wide limits etc.). The manufacturing process works equally for pipe pieces within a size range from 1 1/2" through to 42" diameter and can be manufactured with various wall thickness. Pipe lengths can be produced up to 1.5 m or larger as per special request. Repair workpieces which, after a certain time of service, show severe signs of wear or damage. DECOMETA presents a complete weld cladding capability, utilising the latest automated pulse T.I.G weld stations. Internal weld overlay up to 1.5m length. Weld cladding offers a proven long-term solution against other corrosive resistant alternatives. This "preventive weldoverlap" production method combines a corrosion resistant alloy pipe inside and higher strength carbon steel outer pipe. The range and choice of these liner pipes is large but typically are: 300 series austenitic stainless steels (e.g. 304L, 316L) 6 Mo super austenitic (e.g. 531254) Nickel alloy (alloy 400, 625, 825, 904L).